Night Train made it to the "Final Four" in last year's Wisconsin Beer Bracket. 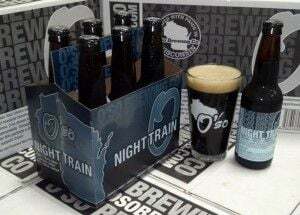 O'so Brewing Company announced yesterday on Facebook that they'll be renaming their popular oatmeal porter, Night Train, because of a trademark dispute. "We are needing help and asking our fans for input. We have been asked to change the name of Night Train over a trademark dispute and have been told by a prominent trademark attorney that we will certainly lose if we fight, WAAAAAHHHH!," the post read. O'so hasn't shared information about where the dispute came from, but Chris Drosner, the Wisconsin State Journal's Beer Baron, has tweeted speculation that the likely party is a wine called "Night Train Express" from E&J Gallo Winery in in Modesto, Calif.
O'so asked Facebook friends for suggestions for Night Train's new moniker, sharing a few criteria: "the new name can't be phonetically the same as Night Train and we have to avoid names that could be confusingly similar to Night Train and no using the word 'express'," their post read. Facebook friends have flooded the post with suggestions, including "Midnight Rider," "O'so Dark," and "Patent Infringed Porter." The Milwaukee Craft Beer Exchange suggested, "Fallen Flag," which they said references "a railroad which is defunct, having either merged or discontinued operations." O'so said the person who comes up with the "winning" name will get 40 pints of the beer formerly known as Night Train at a party at the O'so Taphouse in Plover. "Let's turn this crappy situation into something really awesome," the brewery said in their post. "Let's see what our crazy fans have up their sleeves!" White joined The Capital Times in 2014, where she covers a variety of beats, including music, craft beer, technology, and social issues. She previously worked for Wisconsin Public Radio. The brewery received more than 700 customer suggestions for the popular porter's new name.